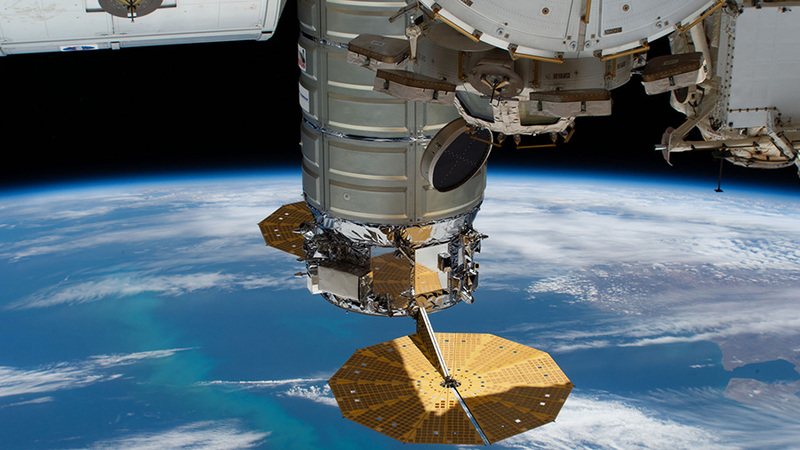 The U.S. Cygnus space freighter and its prominent cymbal-shaped UltraFlex solar arrays are pictured as the International Space Station orbited 262 miles above the Atlantic Ocean off the coast of Argentina. NASA astronaut Anne McClain is studying today the fluid shifts from an astronaut’s lower body to the upper body and how they pressure the head and eyes during a spaceflight. She collected her blood samples for the long-running experiment, spinning them in a centrifuge before stowing the samples in a science freezer. Flight Engineer David Saint-Jacques measured his blood pressure beginning operations with the new Bio-Monitor system from the Canadian Space Agency. The wearable device monitors an astronaut’s physiological data in real-time with minimum interference to crew activities. McClain also had time to relocate and deploy a laptop computer from the Harmony module to the Columbus lab module. Saint-Jacques spent the rest of Wednesday afternoon replacing parts in the space station’s toilet located in the Tranquility module. Commander Oleg Kononenko worked on Russian maintenance in the orbital lab before inspecting and photographing windows in the Russian modules. He wrapped up the day on a pair of ongoing Earth observation studies photographing natural and man-made phenomena. It caught my “eye” that you were doing toilet repair and eye tests! I often describe glaucoma as a plumbing problem where a patient either has the faucet on too much or the drain not open enough. We are proud to be a part of the eye research. I’m very interested to learn more; I work at an aviation & space museum and heard from a visitor that permanent eye damage is currently the biggest obstacle to long-term space colonization. (From fluid pressing on the nerves) Are there any updates or possibilities in terms of treatments/ ways to prevent?